This small patch of grassy earth in south Lincoln is sacred ground. If you look up to see silver barbs on curling wire, if you look right or left to see fences and gates and collections of locks, you will see you are not free. But this ground inside the Nebraska State Penitentiary is freeing for those in this community of 60 or so Native men who step upon it. It is a silent witness to their cleansing, the resetting of their souls, refocusing of their lives. 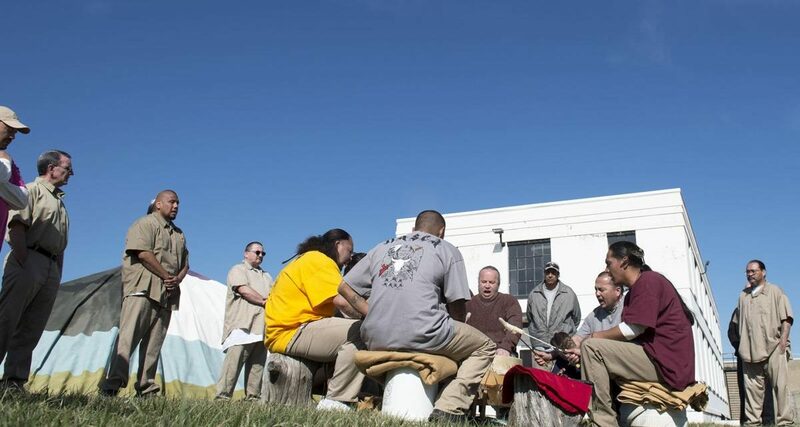 Last week, some of those inmates gathered there to celebrate the work of two friends and their gift of a new tarp for the sweat lodge, a dome-shaped hut where their purification ceremony takes place a couple of times a month. The heat generated in that lodge rids their bodies of toxins so they can offer sincere prayers, purify the mind, let go of the negatives that accumulate throughout each day. Sen. Tom Brewer worked to replace the old tarp that was tattered and discolored and pieced together. Leo Yankton had the vision and the talent to design its colors and images. The world’s on fire, Yankton told the men who made a circle on the patch of grass. They have to work together, because people are looking to Natives for how to bring things back to their natural setting. 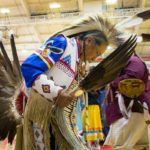 He hopes by telling the story of the sweat lodge at the Lincoln prison they will get support for the materials needed to conduct their purification ceremonies. “There’s always a need for help from the community,” Yankton said. He was there once, locked up for a time as a younger man. He has struggled, he said, but is rebuilding himself, with the help of people who took the time to teach him how to do that economically, socially and spiritually. 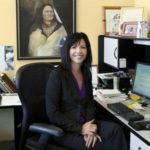 Yankton grew up on South Dakota’s Pine Ridge Indian Reservation, and lives in Lincoln now. He’s started his own landscaping business, runs a hot dog cart and a tipi manufacturing business. They have their eyes on you, but you have to have patience with them, and build yourself up, he said. He talked to them about living sober. “When I first got sober, it took me about three years to feel normal sober,” he said. That’s how long it took to get a social life he was happy with, to have fun again. But he didn’t want to live the other way, because it made him so weak, and made it so easy to fail. He admits he’s still transitioning, and feels frustrated sometimes, but good about what he’s doing and where he is. He can’t afford to make a mistake, because he’ll lose everything he’s working for. Brewer said he knew the design and images for the sweat lodge tarp would take an artist, and Yankton, who has unique skills for the task, never hesitated. He is making a difference in the world, Brewer said of the artist. It is a Native American’s nature to be generous. Brewer also grew up on Pine Ridge, an Oglala Sioux. That was one lifetime. The army and the discomforts of war were another. 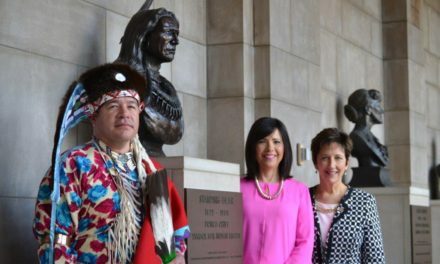 He just completed his second session of the Legislature, yet another lifetime, and one in which he has worked side by side with others, including Sen. Patty Pansing Brooks, to make profound changes to the disgrace that was Whiteclay, he said. “I’ll go to my grave believing it was a good thing,” he said. He also has added to a bill (LB807), introduced by Omaha Sen. Burke Harr, that would allow Nebraska to recall the statue of J. Sterling Morton, an early governor of the state and founder of Arbor Day, and replace it with a likeness of Nebraska author Willa Cather. Brewer’s amendment would replace the statue of William Jennings Bryan, a three-time presidential candidate, with a statue of Ponca Chief Standing Bear. The bill passed last week. As a senator, Brewer has visited veterans and the Native men at the state’s prisons. Replacing this sweat lodge tarp was a labor of love, he said. Roadblocks appeared during the labor, and roadblocks were managed. The ceremony for the new tarp, and for Brewer and Yankton, included drumming, prayers and songs. The six drummers were Miguel Tapia, Jason Tafolla, Ron Sun Bear, Jon Short Bull, Coty Conn and Michael Sims. As corrections officers and Department of Correctional Services Director Scott Frakes looked on, they prayed for health, safety, guidance, protection, nourishment. And that the red road, the right path of life, would continue to be beneath their feet. Sims, a senior member of the community, said having the sweat lodge is uplifting and powerful. It plays a large part in the healing process, and allowing them to become better fathers, sons, brothers, uncles. It has been there for the men since 1974. But over the years, the money to maintain and pay for the wood and stones and the red willow that connects them to Mother Earth has been cut back. They will continue to do what they can, Sims said. To pray and sing to the Great Spirit, to God, asking for help, for balance and harmony, and to continue on the red road, the righteous path. 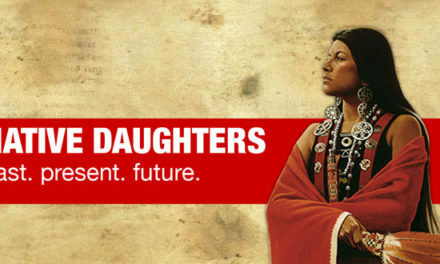 Ms. Magazine Blog Highlights Native Daughters!